@severedhed Oh, sweet. I'll have to try setting that up. I think I'm going to go with the KeyWiz 40 encoder, so hopefully it'll be pretty simple to get it set up for a shift to exit. If not, I'll be picking your brain. @Bender Thanks, I like the hidden buttons as well. I'd been thinking of a way to take them off of the CP and get it as close to authentic looking as possible. And when I had my buddy come over he suggested placing them there. Might be easiest to go all white...then mask off the blue lines...then the bullet/target stencils last. That will look wicked when done! I would do the lighter colors first, overlapping the lines a bit to prevent gaps, darker colors over lighter colors is fine but the opposite will be trouble. They call that method "bleed" in print, though it is for the edges but I think the general idea applies here as well. It probably has another name though. 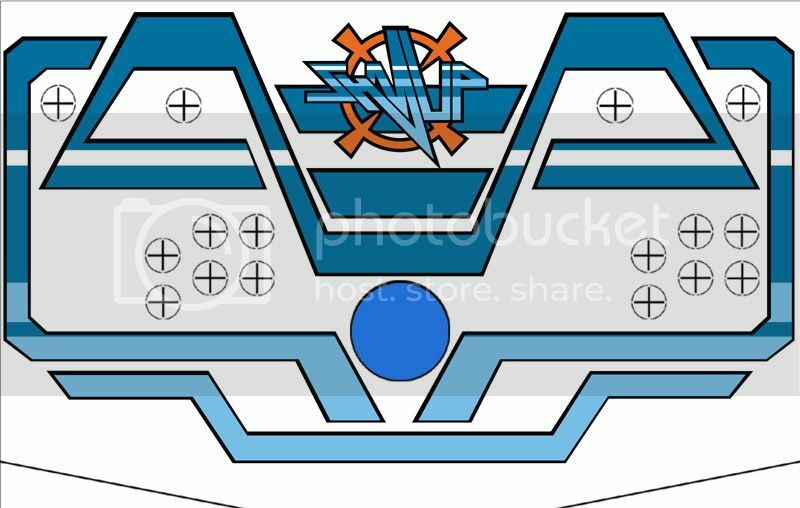 I would do white, then light blue, then dark blue, then orange and finally the black outlines. The trackball mount which Happ had put on backorder arrived today, and I got it all mounted up. Then I began work on getting the monitor situated. It wasn't until I got home tonight that I realized I moved the trackball up on the CP a quarter inch or so (which I decided on the fly when I was laying out my CP on the wood). This means I'll have to take some new measurements and do a minor redesign of the CP graphics to account for the trackball. This is because of how the layout is set up. The lines all come in toward the trackball and since I'm so close to it I'll have to move everything up a little. I liked your design when it was on paper and now that you've started building it... i like it even more. I was wondering if u had any plans for any art around the area where the screen is located. Having the artwork continuously drift from the outside of the side panel to the inside of the side panel and then move to around the screen could look pretty slick. And on the flip side having a solid color is good too.. it attracts all attention to the screen, where all the actions happening. I'm not sure if its the modified design, or the color scheme and the cool artwork, or both but this has evolved to be one of my favorite cabs. you kind sir, have outdone yourself. good job. Thanks! Everyone's kind words about the design as a whole are totally helping drive me as I work. Because it makes me want to create the best possible work I can do. As always outside input is always welcome. So I guess to answer your question.... I don't really know! I think your current graphics theme would look awesome around the bezel, but, it might be overkill. You've got a great retro theme that really would look the part around the screen, but you've got pretty intense artwork on the marquee and cp. Some progress was made today, I fit the monitor in place and test mounted it on the panel. Then I ran to Best Buy and bought a set of 2.1 Logitech speakers Which I got for half off, w00t. When I went up to pay for them the guy asked me if I wanted the warranty... I said "nope, I'm good. I'm probably going to void the warranty as soon as I open the box anyway." I think he thought I was being snide. When I got home, I started work on measuring out the placement of the speakers and then headed to my family's business to use our mill to cut the grooves for the them. It took a little bit of trial and error but with the panel in place, you can't really see any of the starting mistakes I made. And since I couldn't find the proper cutting bit, I ended up using a countersinking bit to mill the grooves. Which, turned out ok since if gave the grooves a bit of a bevel. After I cut the grooves I went back to my work area and routed the inlay areas for the speakers to sit in, leaving roughly 1/4 of material where the grooves are. Test fitting the monitor mount to the monitor. On Jeef's suggestion I did another mock up in photoshop. This one complete with all pieces in place. I think it looks rather nice with the plain black bezel area... what do you guys think? It makes the colors pop even more IMHO. Looks professional and I would go with the black bezel personally. 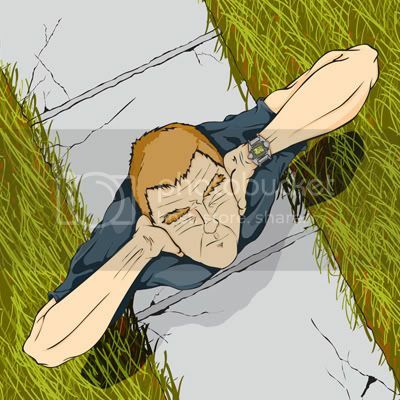 Agreed, I think putting the graphics on the bezel, as well as making a custom MaLa layout may be too much. 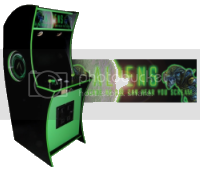 But the black will help give that dark arcade room feeling while the MaLa layout will add that little bit extra to the design when not playing games. Disregard my .02 cents from before.. that updated mock up pic looks really slick. You're going to have a really nice cab when it's all said and done. 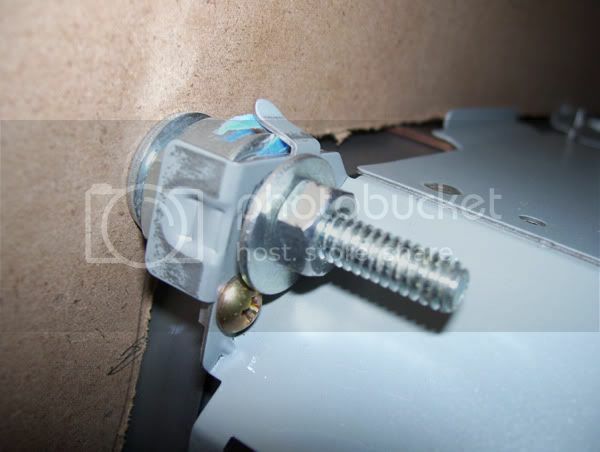 After completing the speaker panel and monitor mount, I placed the light mount for my marquee light to attach to. This completes construction of the front of the cab! Wee! I spent Sunday and today painting. 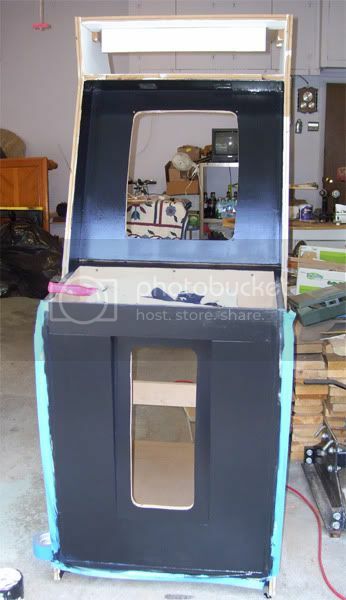 I primed the CP/Coin/Monitor/Speaker areas, and had to let that sit for a day, then this afternoon I wet sanded it and applied the first coats of black. I am back in paint hell for the next couple of days. 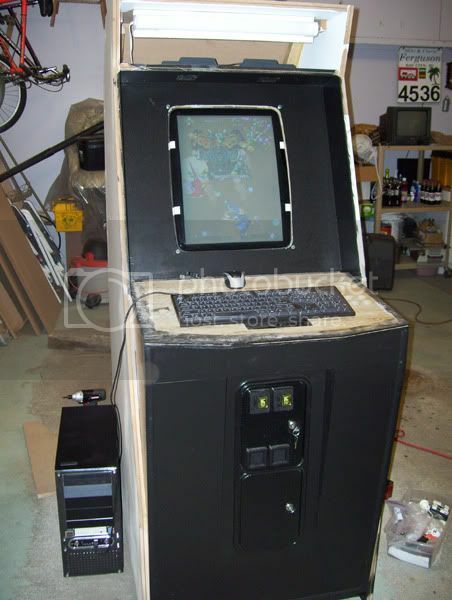 But once I am finished I'll mount the monitor and get to work on the back of the cab. Which will be my access point for the insides of it. 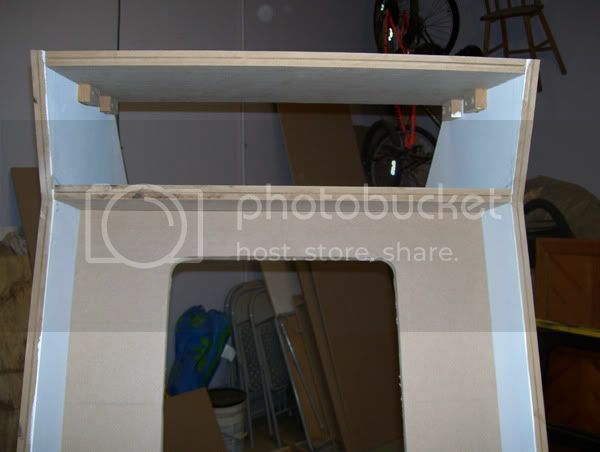 So I'll be building a door and figuring out how I want to set up the PC. I've already decided that I want to gut my tower and mount everything to a board. 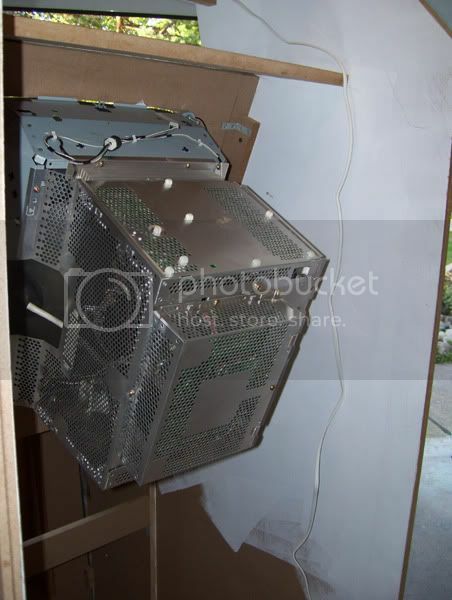 I plan on mounting the PC component's board to drawer slides so I can open the rear door and slide the PC right out when I need to work on it.... which I hope isn't very often. As far as the PC goes, I've got it pretty much all set up. I actually was in my apartment playing around w/ MaLa and I played a little Gunbird 2 with the keyboard.... it was fun, but I can't wait to use actual controls... Never fear, installing the PC is my last possible step in the build, so when I am to that part I should be nearly finished. The light mount for my florescent light. Secondly, when I was pulling the tape, it peeled back some of the paint on the face of the angled front panel... So in a bid to save my paint job and waste hours of work. I used the backside of my knife to pry the t-molding out slightly and then continued peeling it back slowly, making sure that my removing it wasn't going to mess up the groove in the MDF. After the t-molding was removed I quickly rolled fresh paint on the edges that were slightly messed up and tomorrow I will do another sand job to smooth everything off and then repaint one more coat of black on the CP stand's front. 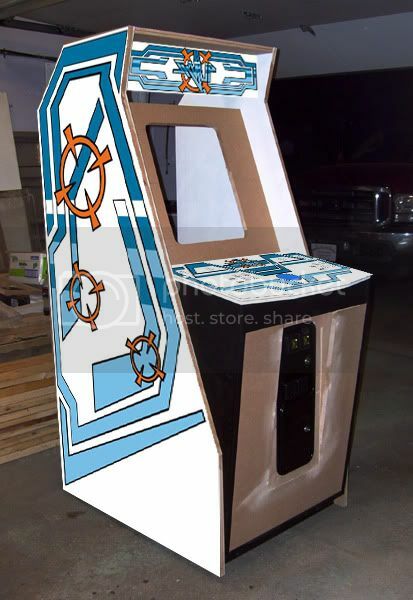 but with this I have learned a valuable lesson on arcade building.... and that is if it seems like a good idea... stop, look at it and then change your mind and do it a different way... cause the best ideas at the time aren't always the right ideas. And that includes mounting t-molding and taping off obstacles. Anyway, tomorrow before I do the next coat of paint I plan to mount the monitor! 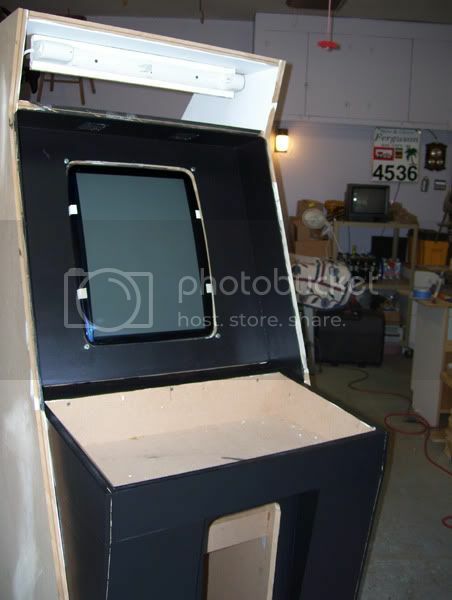 Once the monitor is mounted, then I can start work on the back of the cab. Exactly what I was thinking! I need to go through the games I have an trim it down. It's way too many right now.... But I guess that's what the MaLa tree is for! Last night and today I made some decent headway on the cabinet. 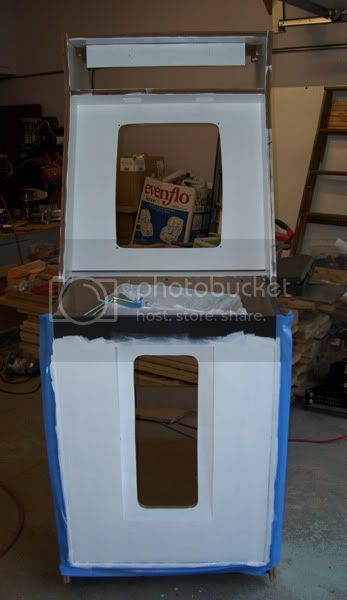 I started yesterday by mounting the monitor in place, then I put my final coat of paint on the cp stand. 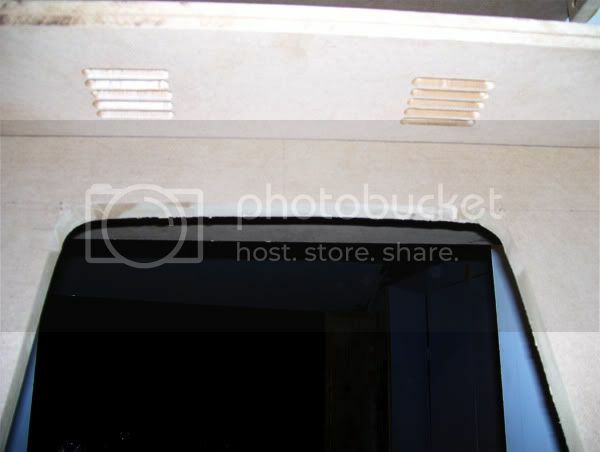 Then tonight, I mounted the light in place, and worked on mounting the sound system to it. 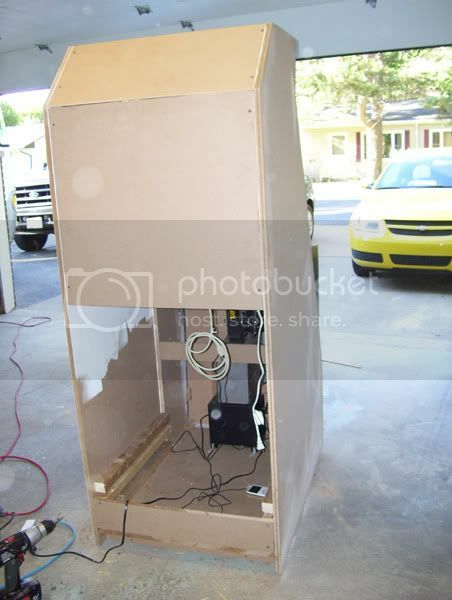 I placed the subwoofer under the coin box to keep it close to the front of the cab and mounted the volume control unit to the top of the coin box. There is enough room above the bucket that I didn't have to worry about catching the lip of it w/ a screw. 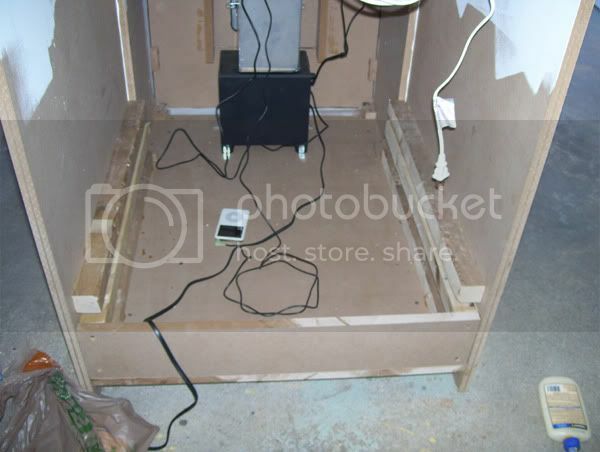 With the volume control in place and the subwoofer below the coin door, I can adjust the bass and the volume through the coin mech door rather easily. Monitor mount. Yes that is a 1/2" Nut and 2 1/4" washers being used as spacers. Rear view of the monitor. It misses the back panel by about an 1 1/2" gap. Front view of monitor. 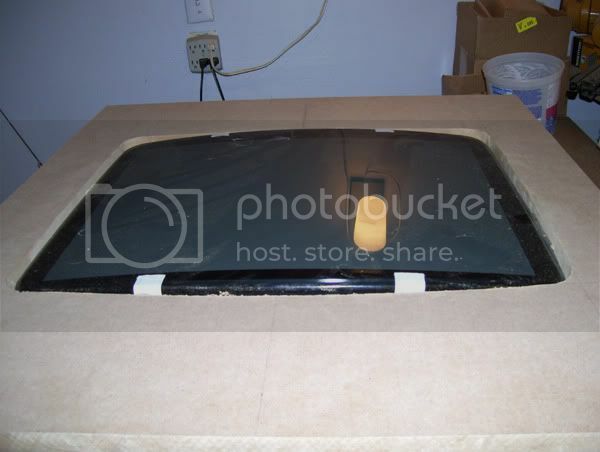 The will be a piece of black matte board over the screen to cover the edges and the bolts. Volume and Power control for the speaker system. 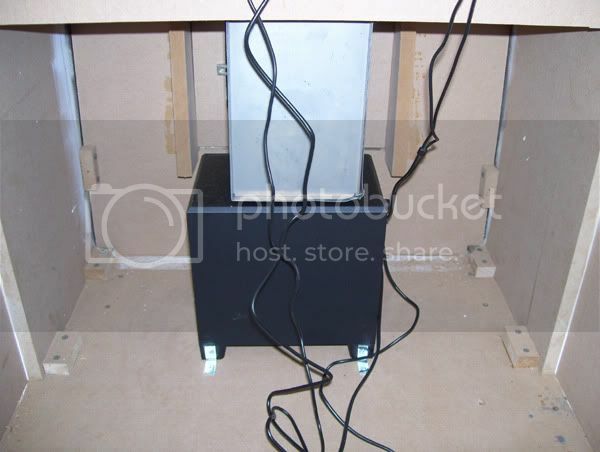 Sub mounted under the coin box. Looks like you've got a nice big garage to work in! Ya, I've been working on it every chance I get. We have a nice 2 car garage at my folk's house so I have a lot of room to work in. Plus my dad has pretty much any tool I need right there, so it makes things a bit nicer. Plus that stack of wood is all scrap from shipments we get in at work, which means it's all free. 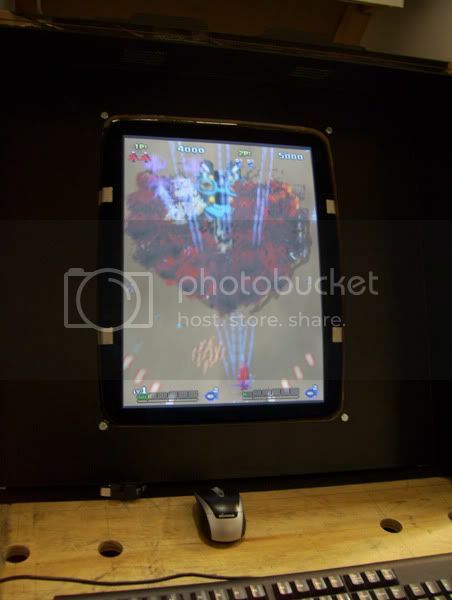 Today marks 1 month since I started posting my progress of the SHMUP arcade. 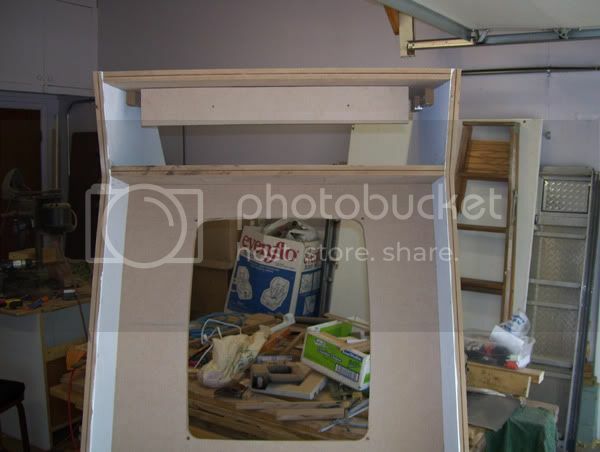 Over the last couple days I've mounted the back panels and started working on the insides of the cabinet. 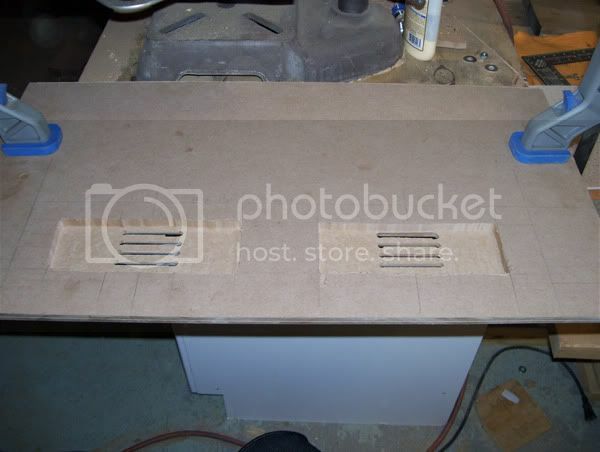 Currently I have the 45 degree angle panel, the upper back panel and the lower panel completed. 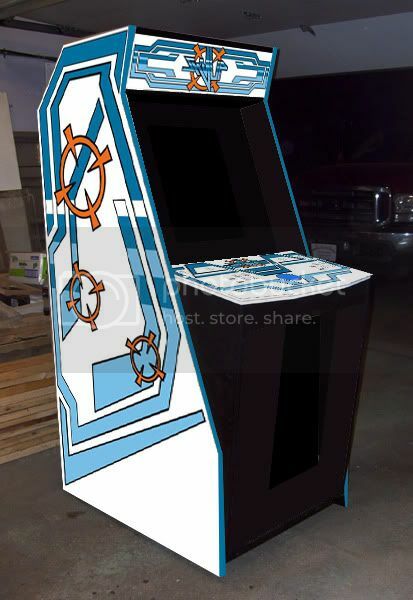 I still need to do the cabinet doors for the back, but I'll do that after I get the PC mounted on the slider board and the electronics and wires figured out. Also I picked up a power strip and started testing out the monitor and PC. I played a little Gunbird 2 using the keyboard which helped me set up the sound system and adjust the color for the time being. nice, don't do do much testing! 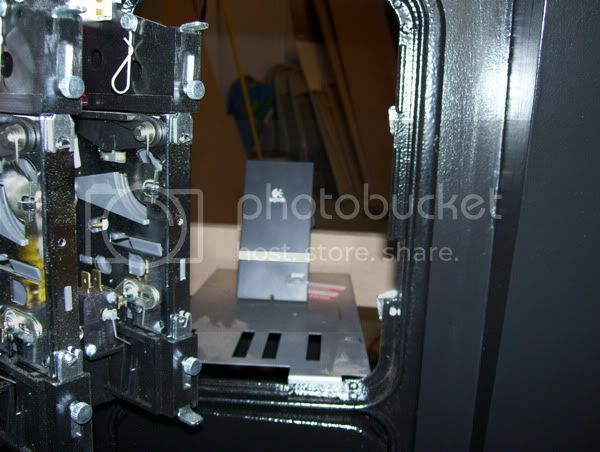 Also, today I ordered 2 black push buttons, the rest of my t-molding and a key-wiz 40 encoder. So I have been testing things out and I picked up a Rocketfish 7 plug surge protector with 1 master outlet and 4 slave outlets. The problem I am having with it is when I power down, it is not shutting off my monitor,speakers and marquee light. I know there has to be a way to get it to work properly as I don't want to have to extend a power switch to the cab along with the regular power button. Any ideas on what I should be checking out? Does this not have a pot for setting the "startup" level? 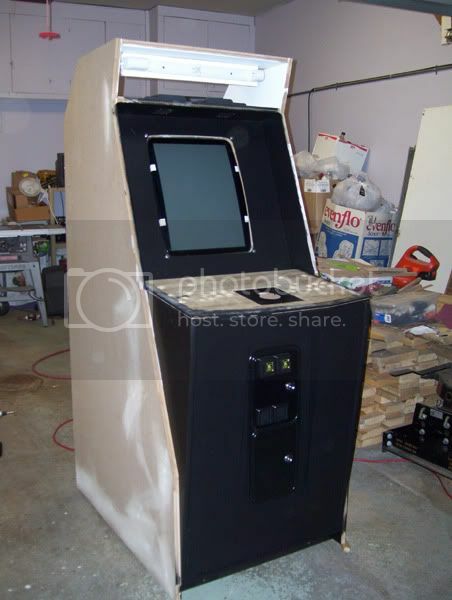 When I had a MAME cab, I had a similar product, and it had a little pot that you could calibrate with a screwdriver. Most computer draws a little power all the time as to be able to have network startup enabled etc, so if you have this setting, you'll have to set it to look for a surge way above that power level for it to do work it's magic. does it work if you choose SHUT DOWN instead of standby? Oh I thought I mentioned that. I does not power off the slave outlets if I select SHUT DOWN, like the power supply is still leeching power and telling the power strip that the PC is still on when it's not. thats weird. i know some of those strips do have a sensitivity adjustment, but not all of them. I used a craftsman auto switch for my cab...it had no adjustment, but works perfectly. Ya I'm gonna look into it and see if there is an adjustment. If not I'm going to hook that one up to another PC and see if it does the same thing. Worst case, I'll go looking at other strips. There's got to be a way to get it to work properly. I know u can working something out and make it work. And great progress on the cab btw. I really dig everything about it. 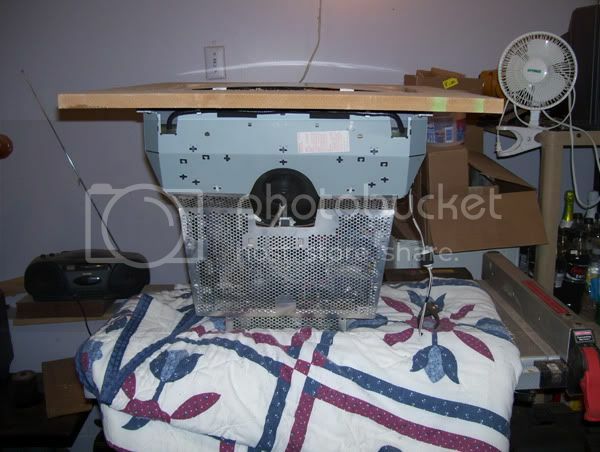 I read about your auto switch, I looked into it, but I need 3 power outlets for the speakers, monitor and marquee light. Of course, I could use a splitter on one of the slave outlets I guess. yeah..i just plugged a cheap power strip into one of the outlets so I had enough. Not much progress-wise this week. I think I may have burned myself out a little with the pace I had been working, so I took a little break. But some things have happened this week regardless. I started planning of my MaLa layout, but I've not done any Photoshop/ Illustrator work yet. Mostly playing with the Layout editor and seeing what does what. 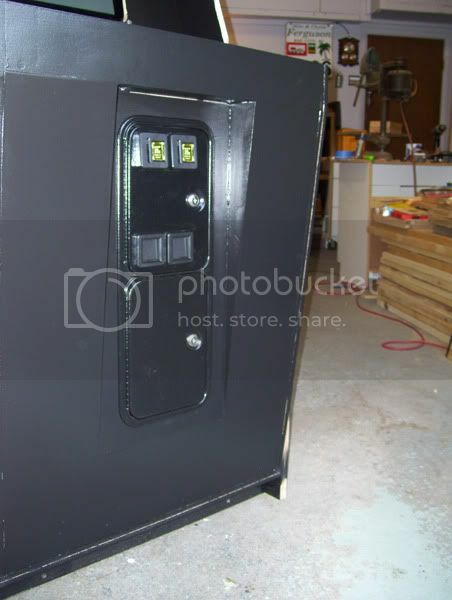 Sunday I ordered the rest of my T-Molding (40ft of Deep Space Blue, 6 ft of Black, 2 Black buttons for the hidden admin keys and a Key-Wiz 40 w/ screw terminals. Also I have my wire and am working on how I want to wire everything as neatly as possible. The CP top pops off the Cab, so I may mount the Key-Wiz and Opti-wiz to the bottom side of the CP. Then I'll run Grounds to junction blocks, also on the bottom side of the CP. This would make the only wires running from the CP stand the coin mechs and the 5v and ground to the power supply. This should give me the cleanest possible wiring I can think of. Taking severedhed's suggestion, I'll be wiring P1's 5 and 6 buttons to the opti-wiz for mouse buttons. I looked into hacking a microswitch to the coin mechs, but decided against it. I think, I'll hide a Shazaam function so I can coin up. But my main goal is to get the mechs accepting tokens.... does anyone know if you have to tweak Happ $.25 coin mechs to accept Arcade Replay BOYAC tokens? I've been slowly filling screw holes the last couple days too. Making sure the sides are as flush and smooth as possible. Since the artwork is going to betaped and painted, I need to have as nice a surface as possible to tape to and if it takes a boat load of wood putty, so be it. It looks like the only day I'll be working on the cab this weekend is Sunday. Which will prolly be a primer and sanding day if anything. Fun fun. 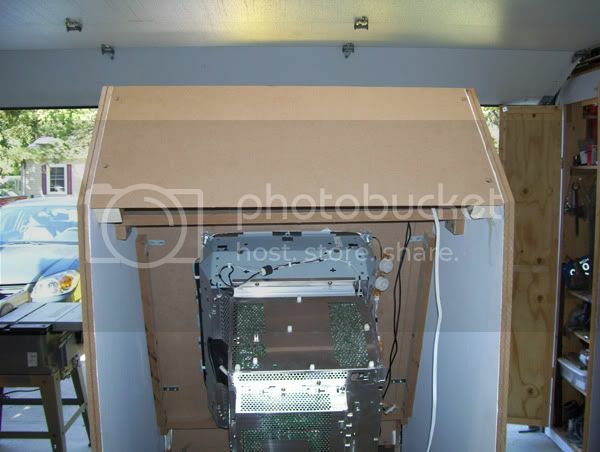 But while I am doing that I can continue setting up the PC before I gut it and mount it in the cab. That way it's set to go after it's installed and I won't need to modify anything once it's in place... I grow tired of looking at windows sideways, haha. I'm also going through my games list and deciding what I want to keep on the cab and what to pitch. I've got a decent list of games so far, mostly shoot em ups, of course. I'll write up a list of games once I've gotten it all decided. I had R-type. But forgot Raiden and Pulstar... I've never heard of the Slapshot / A.L.C.O.N. though, I'll have to look into it. 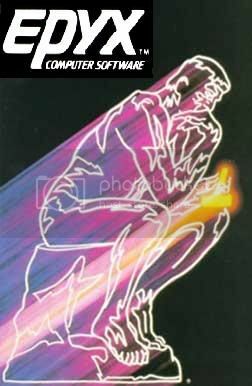 Just for fun, you could post an up-to-date list of the games. It's easier to suggest games if we see the current list, otherwise you'll have people suggesting the same games over and over. Ya, I totally agree. I'll post the games I have on my list when I get home from work.